Going to a Catalonia beach outside of Barcelona is a great idea if you are looking forward to spend a whole day of relaxing by the beach away from the nice and the hassle of the big city. So if you have already explored the best Barcelona beaches, today we’re going to share with you our favorite secret spots for a day trip to the best nice beaches near Barcelona. The Catalonia beach offers a magnificent Mediterranean landscape, and there are so many nice beaches near Barcelona! North of the city you have the famous Costa Brava with its cliffs and calanques, and south you have the Costa Daurada with its sandy golden beaches. What is your favorite? Calella de Palafrugell. On the Costa Brava, a local favorite off the beaten path where you can enjoy small rocky beaches, old lighthouses and impressive cliffs. Barcelona people choose Calella and the surrounding towns for their family vacations. Tossa de Mar. The medieval watchtower the drivers over the hill in one end of the beach is a beautiful side and it reminds us of the historical origins of this beach town. Being only one hour from Barcelona and Girona, it is a great idea for the day of beach and sightseeing. Tamarit. My favorite it beach in the Costa Daurada: long, with golden sand and the view of a medieval fortress also at the end. And also nearby, if you don’t mind walking across a pine tree forest (and you are okay with naked people too…), the Punta de la Mora is a hidden paradise. Sant Pol de Mar. It’s not that difficult to find nice beaches near Barcelona: If you don’t have a car to drive, the suburban train will take you to these little fisherman town famous for a 3 Michelin star restaurant: Sant Pau. I don’t think any guidebook recommends the place for its beach… But I can tell you locals are very happy about that! Away from the tourist crowds, it still keeps all its charm. 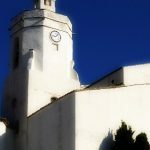 Cadaqués. This Catalonia beach was made famous by Salvador Dalí, who spent part of the year here. Although it is a little bit far for only one day, this tiny fisherman village near the border with friends will make you feel like you are all of a sudden in Greece: whitewashed houses with cobblestone alleys and windows painted in blue. A secret spot for artists, bohemians and high society all at once. AND BONUS! Our last recommendation is possibly the longest sand beach in Catalonia! Platja del Fangar. To find one of the nicest beaches that are still kept virgin and wild, you’ll have to drive south to the Ebro Delta, almost where the Catalonia beach line ends. This long fine white beach is famous for its landscape and nature (there is a natural salt-water lake next to it awesome for birdwatching) as well as for its winds that are wonderful for all kind of water sports. By the way, do you know that we organize day trips to most of these nice beaches near Barcelona? Ever been to one of these? Tell us what’s your favorite Catalonia beach on a comment below!